Today I wanted to spend some time on getting started with AmiCygnix on the AmigaOne X1000. 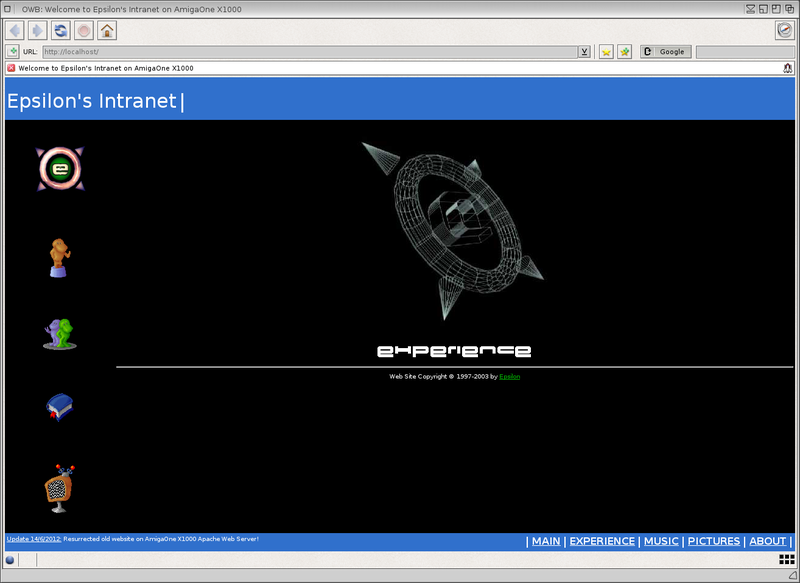 Using Apache Web server on AmiCygnix I want to show using Apache Web Server to run an old website of mine on the X1000! 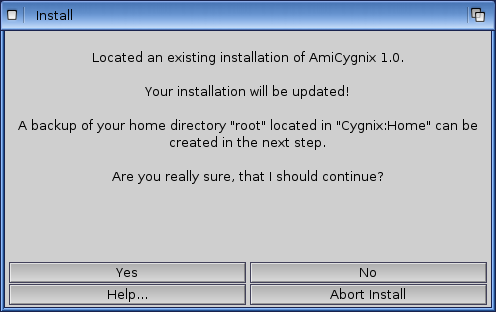 So what is AmiCygnix? 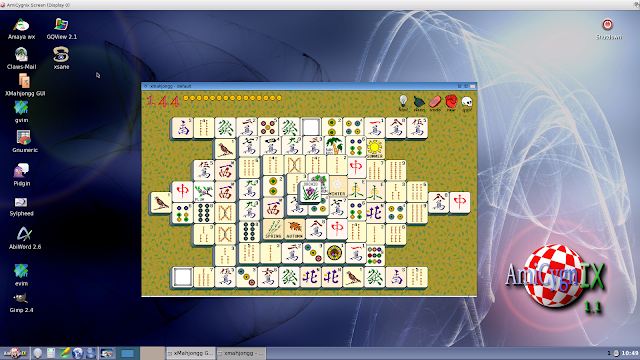 Basically, it is Unix X Windows environment running under AmigaOS4 which allows Unix applications to be more easily ported to AmigaOS4 and the X1000. 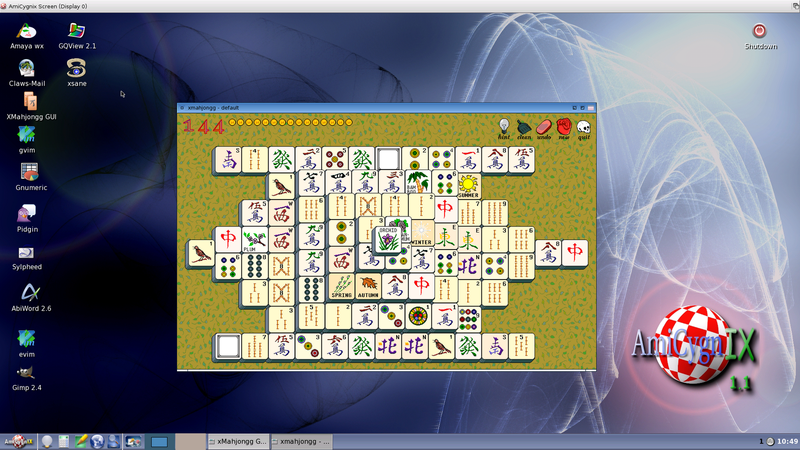 There is a lot of Unix software that has been ported to AmiCygnix already, like Gimp, Netsurf, Abiword, Gnumeric, MySQL, Apache Web Server with PHP, and many more Unix applications and games. All of the Amicygnix software packages can be downloaded from OS4Depot.net. 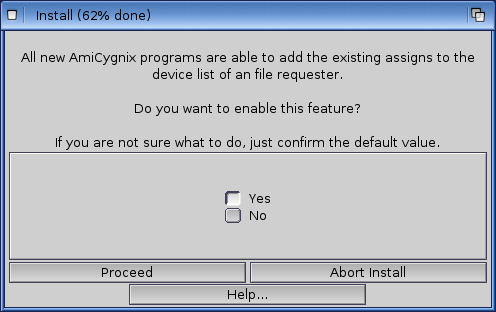 Last night they released v1.1 of AmiCygnix-Base and AmiCygnix-Tools with updated applications and features! 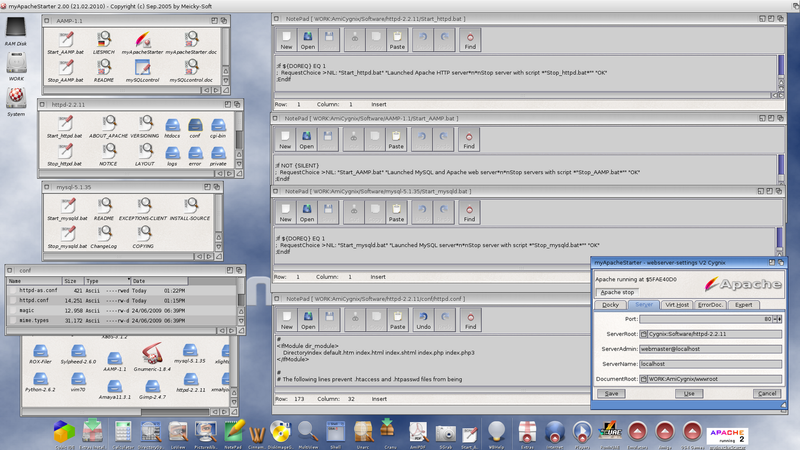 I am particularly interested in the new feature to run Amicygnix applications within AmigaOS4 Workbench screen itself, side by side with native AmigaOS 4 applications. 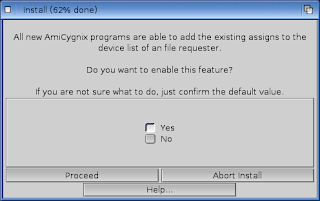 This hopefully means I no longer have to run AmiCygnix on a separate screen to Workbench. I will try this out in another entry! 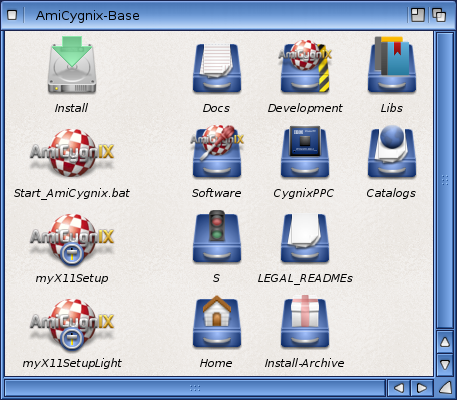 Amicygnix-base is the minimum required to be installed for the base operation of AmiCygnix. 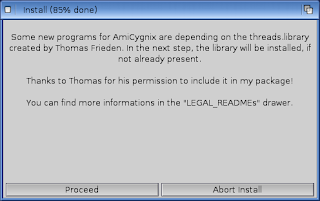 I recommend also installing AmiCygnix-Tools also, and choose what applications you want after those are installed. 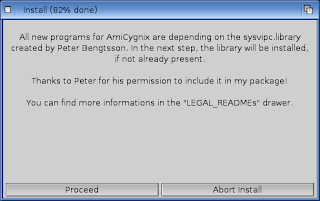 I installed all the packages available, some include amicygnix-games, AAMP (Includes MySQL and Apache Web Server), Gimp, Xsane, Pidgin, etc. 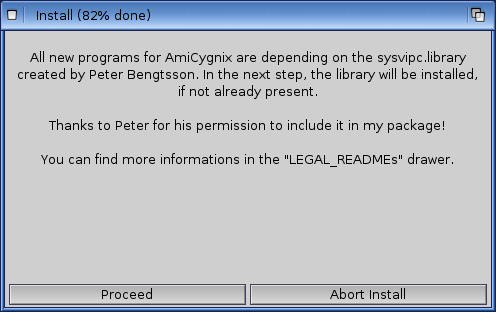 The installer for AmiCygnix and it's applications is a breath of fresh air compared to most installers on the Amiga recently - nicely presented and works well. 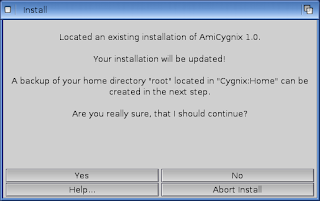 However there are a lot of options when installing AmiCygnix-base in particular, and to help people out I have included a step by step of what to expect when installing it. 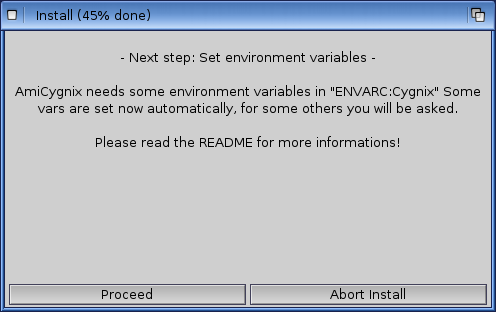 You will then see this message below telling you things you should know before installation. 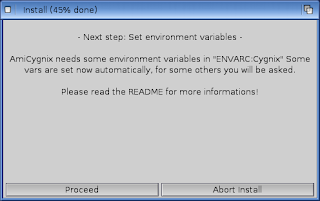 Read carefully and close the window to proceed with the installation. 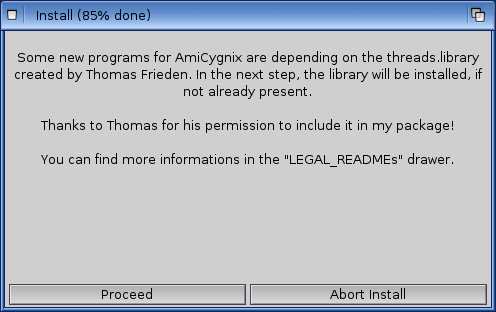 In my case, because I already had AmiCygnix 1.0 installed, it detected this and prompts me to backup and update the existing installation. I said Yes. 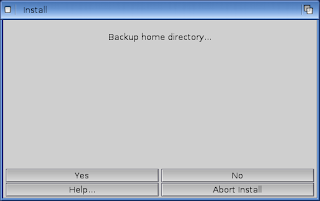 Next, the install scripts takes care of backing up the old version for you, which is a nice touch! I said Yes to do this of course! 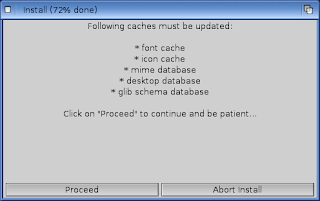 The installation then proceeds as below, but you will be prompted with many different questions along the way, and I will cover them in this guide. 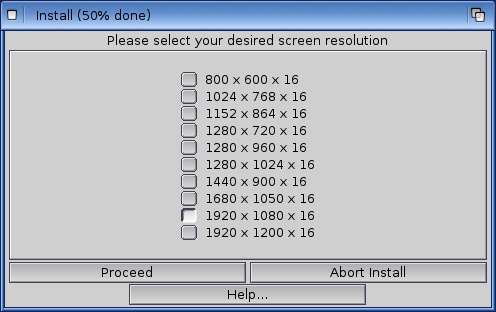 The next screen just lets you know it will set some environment variables - just press Proceed. 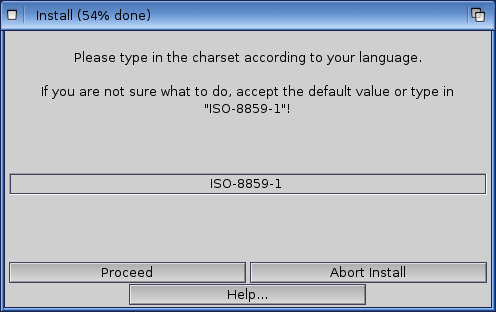 Next up it asks for your language - since I use English I can leave the default language en and click Proceed. 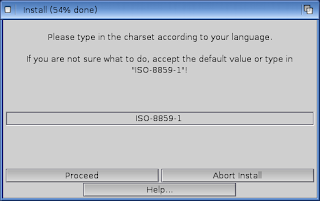 Next it asks for you character set, which you can leave as default if using English as default and Proceed. The next question relates to your Timezone location, which needs to be entered using Country/Location format. 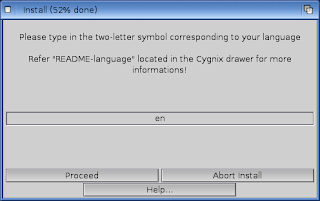 To help, a zoneinfo window opens up in this step showing all the timezone countries and locations underneath which you can browse - these names correspond to the text you need to put into the dialog box to then Proceed. 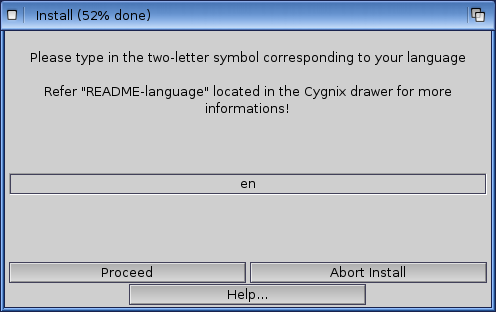 Once you have entered the text in the box correctly, you can close the Zoneinfo window as it is no longer needed for the installation. 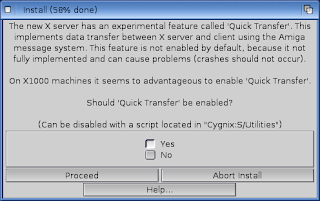 The next question relates to Quick Transfer feature which you want to say Yes to enable on X1000 machines and then Proceed. 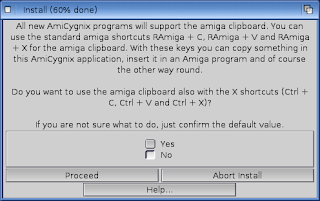 The next question is for Windows users - it asks if you want to use Windows Cut, Copy and Paste shortcut keys instead of Amiga shortcut keys for the same functions. I left it as No and pressed Proceed, but this is really personal preference! 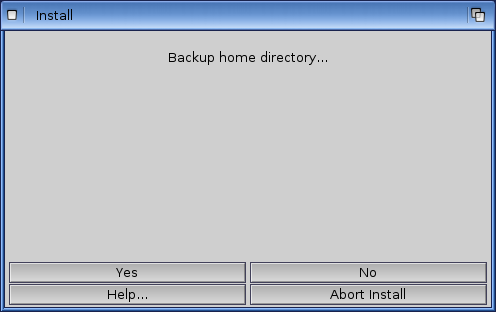 The next few questions I left at default Yes/Enable and clicked Proceed. Installation has advised it is now complete! Congratulations! 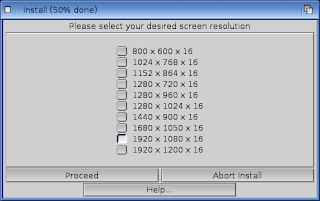 A reboot of the X1000 is needed to get AmiCygnix working correctly. 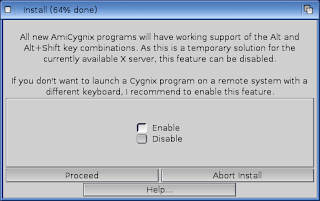 I then proceeded to install AmiCygnix-Tools and the other applications I wanted to use, like Gimp, AAMP (Apache Web Server and MySQL), Pidgin, Games, etc. The installation process is straightforward for these installations so I won't show them here. 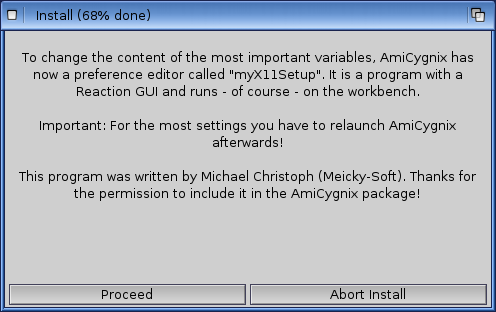 Having finished the installations, I launched AmiCygnix from Work:AmiCygnix by double clicking on Start_AmiCygnix.bat icon. I later added this to the Workbench dock for quick access. 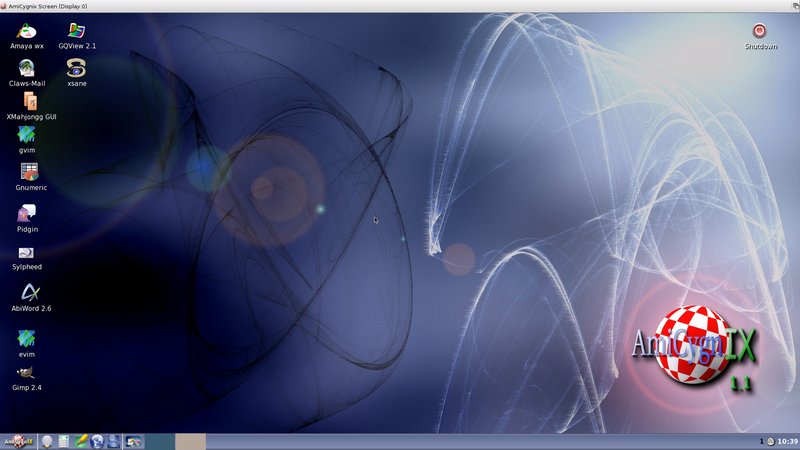 Now, not everything has to run under AmiCygnix desktop to run on the X1000. 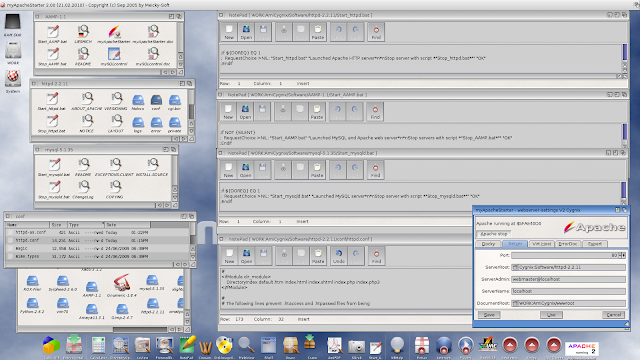 When I installed AAMP (Apache Web Server/My SQL) I run AAMP startup daemons in the startup files (this option is presented during installation) to enable Apache Web Server to run on the X1000 under AmigaOS4. 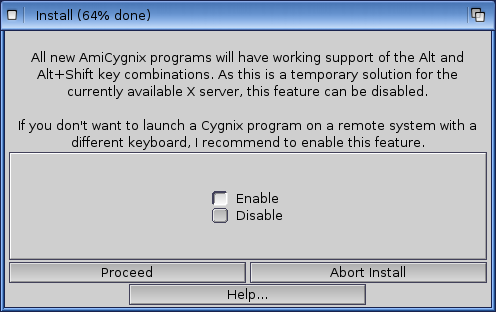 As part of doing this you end up with some annoying screen prompts on AmigaOS4 boot up that have to be closed every time. To remove these I edited some configuration files to comment out the lines that pop up the text with a ";". These files are start_httpd.bat, start_aamp.bat, and start_mysqld.bat in 3 separate folders under Work:Amicygnix/Software which I show in the next screenshot for your easy reference. 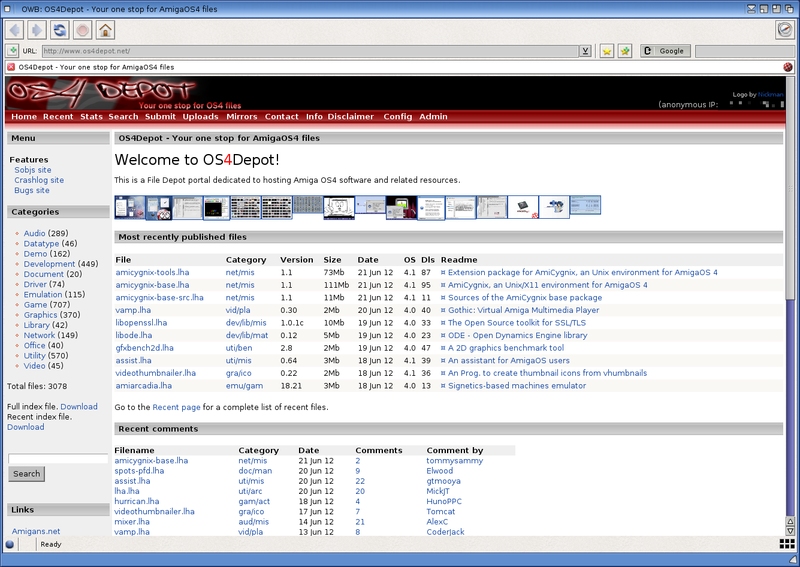 I also changed the default website location in Apache Web Server because I created a new folder in Work:AmiCynix/wwwroot for hosting my website files. To change the location of the website folder in Apache, you need to run myApacheStarter which is located in the Work:Amicygnix/Software/AAMP-1.1 folder. 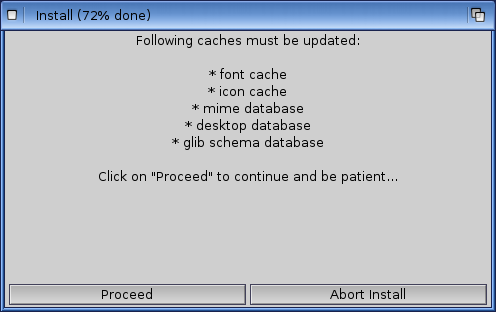 You also use this program to start/stop the Apache web server. I show the "DocumentRoot" location that needs to be changed in the screenshot below. 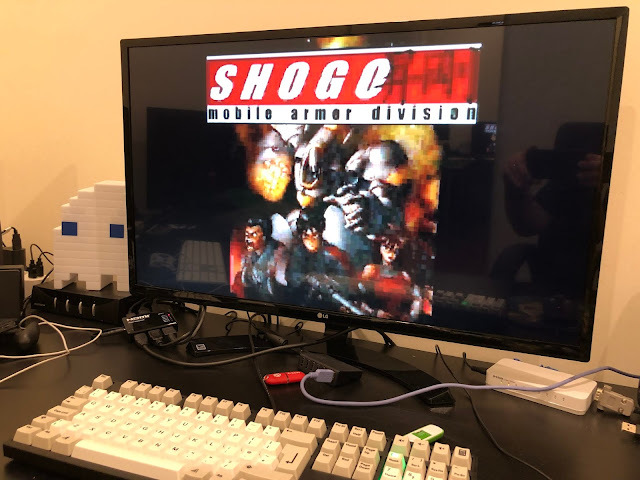 After this, I then changed my Amiga's networking setting to use a fixed IP address, and then tested that my website works, running on Apache on my X1000! Happy Days - it works! 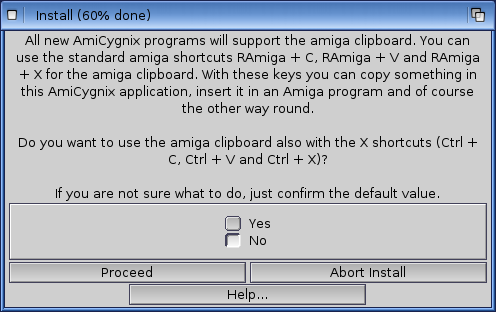 I will of course do some more playing around with the AmigaOS 4 integration feature of AmiCygnix later on and report back on how it goes in this blog! 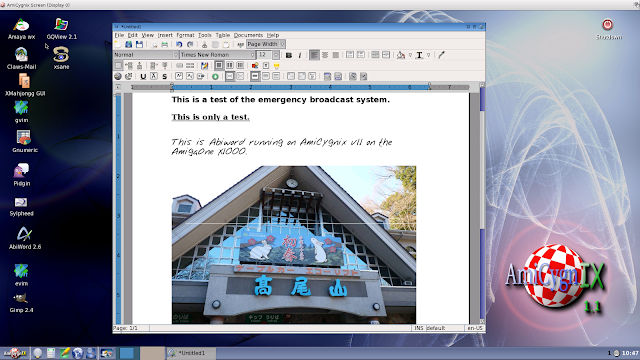 I used to say: "rather boot into PPC Linux and OpenOffice" as it is more compatible regarding MS Word Docs. 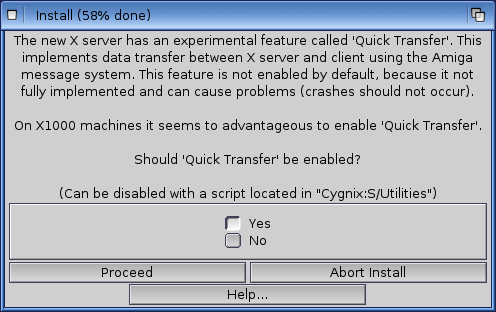 However starting AmiCygnix on X1000 is ultra fast, and much faster then booting into Linux (Which was different on SAM440). Whow - what a nice report! I really love it. Sun an easy to understand documentation is missing in my package. 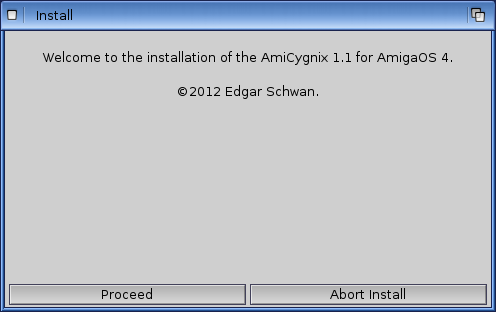 Stay tuned for other new software packages for AmiCygnix. 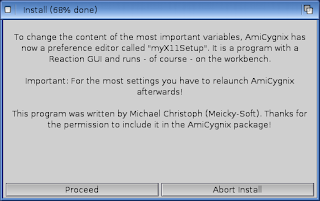 Good article :) When you begin on Amicygnix programs in workbench windows I would like you tried with Gimp. 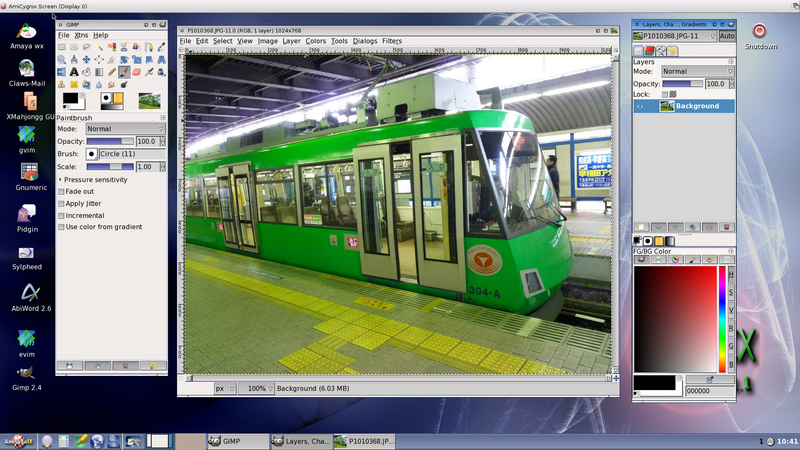 It is hard because it opens up 3 windows simultaneously. My AmigaOne X1000 has arrived!